Tom Swift enters an upcoming race with his specially-designed prototype electric race car. But as he makes the final preparations and adjustments, days before the race, he discovers a plot that would bankrupt not only his family, but also everyone else that relies on the local bank (which is the target of a nefarious bank-run scheme). Tom must solve the mystery and stop the criminals behind the plot before he'll test himself on a 500 mile race against some of the best electric cars and skilled drivers in the United States. 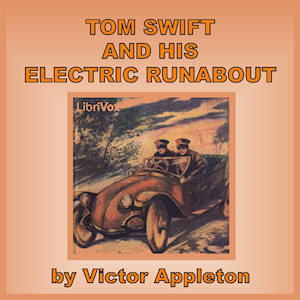 Listeners are forewarned that some elements and characters included in Tom Swift books portray certain ethnic groups in a very dated manner that modern readers, and listeners, may find offensive. Despite the racially stereotyped behavior and pronunciation in the books, the Reader believes it makes sense to read what's written in order to be faithful to the author's intent.